Kings of Leon singer Caleb Followill hates your kids. Who doesn’t love Glee’s quirky weirdos, dance numbers, spontaneous singing, and improbable plotlines? Kings of Leon, that’s who. Last August, the band turned down a request to have the show cover some of its songs, and that made Glee creator Ryan Murphy very mad. 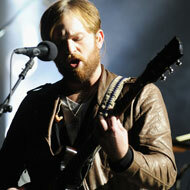 Kings of Leon’s floppy-locked singer Caleb Followill was taken aback by Murphy’s comments. “This whole Glee thing is a shock to us. It’s gotten out of hand. At the time of the request, we hadn’t even seen the show. It came at the end of that record cycle, and we were over promoting [“Use Somebody”]. This was never meant as a slap in the face to Glee or to music education or to fans of the show. We’re not sure where the anger is coming from.” Then, we imagine, he slumped off, dangling a lit cigarette while ruffling his shaggy hair.